When Jason “ANTi” Bates won the Super Smash Bros. for Wii U tournament at Smash community major Get On My Level this past weekend, he exercised his rights as champion to celebrate his accomplishment. That said, he may have gotten a little too hype (if such a thing is even possible) when his victory lap spread to a different broadcast. Big fighting game events usually only have one game on the main stage at a time, but Get On My Level ran the finals brackets for both Super Smash Bros. Melee and Smash 4 side-by-side, with separate broadcasts for each. 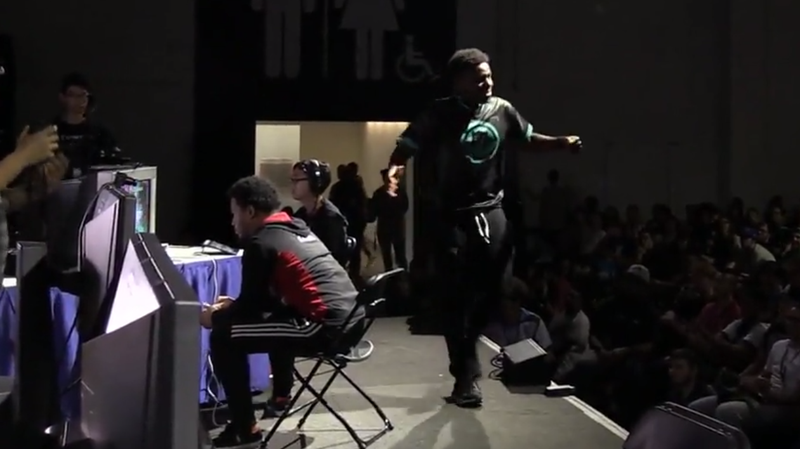 When ANTi defeated personal demon Larry “Larry Lurr” Holland in the Smash 4 grand finals and got out of his seat to celebrate with the cheering crowd, his pop-off also showed up in the background of the Melee stream during a tense losers bracket match. Viewers quickly produced Twitch clips of the moment on both streams, providing us with a dual look at what exactly went down. One of the players involved in the Melee match, Ryan “The Moon” Coker, jokingly uploaded a video complaining to ANTi that the Smash 4 champion’s antics almost made him lose his match against James “Duck” Ma. ANTi’s reply was to simply flash the various rings and medals he earned at Get On My Level by winning Smash 4 singles and doubles (with partner Tamim “Mistake” Omary) as well as the tournament’s Super Smash Bros. Brawl event. With a slew of less-than-impressive placings over the summer, ANTi’s victory at Get On My Level is a sign that things are looking up for the young, brash competitor. No matter where he ends up, one thing has been made clear to ANTi’s future opponents: don’t let him win, or he’ll let everyone, even people who aren’t watching the match, know he beat you.